Minneapolis, MN 55411 for a fun social gathering beginning at 6:30pm with light refreshment. Registration, Workshop Deadline Extended, Location, and more! Registration is now open! Please visit our website to register yourself or a group of youth. Help us out and do it early so we can be as prepared as possible with food and childcare! Workshop proposal submission deadline is EXTENDED to September 13, 2015 – so get your workshops in, folks! Share your knowledge and expertise or convene a discussion around an important topic toward social justice in education. Stay tuned for an exciting keynote announcement! Please share the updated flier with your friends and colleagues. 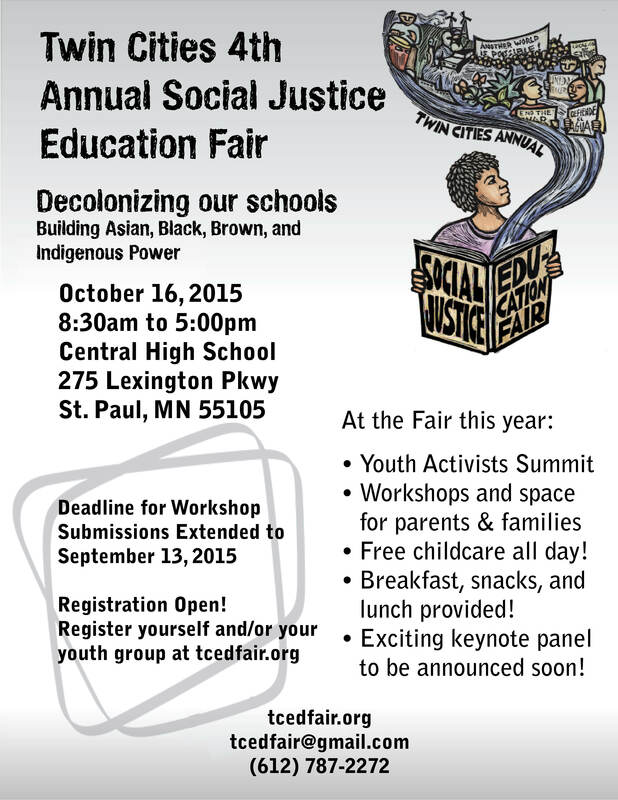 To find out more about opportunities to volunteer for the fair, please contact us at tcedfair@gmail.com or call (612) 787-2272.